This index contains "live" backlinks only. 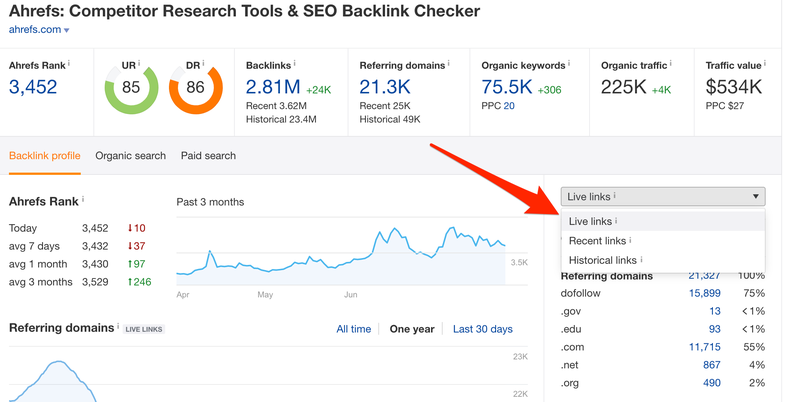 A backlink is considered "live" until we re-crawl the linking page and see otherwise (which usually takes us anywhere from a few hours to a few weeks). This index consists of all "live" backlinks plus "lost" backlinks that had "live" status during the last 3-4 months. The link is considered "lost" when we don’t find it on the referring page while re-crawling it, or the referring page itself is not available for some reason. This index is a record of all backlinks that were seen by Ahrefs crawlers as "live", but not necessary live today. We started recording data to this index in May 2016.